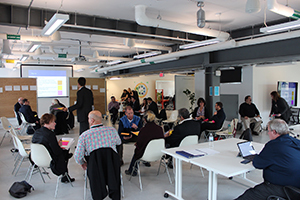 The Natural Step Canada announces the launch of the Ontario Circular Economy Innovation Lab, a new collaborative initiative to accelerate the transition to a circular economy. 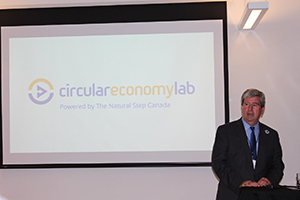 Toronto, ON, October 27, 2016 – On Wednesday evening, together with public and private sector leaders, The Natural Step Canada launched its newest initiative: the Ontario Circular Economy Innovation Lab (CEIL). The launch event, Accelerating the Transition to a Circular Economy, was held at Evergreen Brick Works and included remarks from business and municipal leaders as well as the Honourable Glen Murray, Minister of the Environment and Climate Change Ontario, who outlined the challenges and opportunities for Ontario as it transitions to a circular, low-carbon economy. “Together, Ontario’s Waste-Free Ontario Act and Climate Change Action Plan will help reduce greenhouse gas emissions while moving our province toward a circular economy — a system where materials are not discarded, but reused or recycled into new products. I commend The Natural Step and everyone taking part in this Circular Economy Innovation Lab for demonstrating leadership in Ontario’s transition to this new framework. Managing our resources more effectively will benefit Ontarians, our environment and economy and help our companies become more competitive in the global marketplace”. The “circular economy” is an emerging economic model championed by leading thinkers around the world. In contrast to a linear approach in which resources are extracted, used and sent to waste, a circular economy seeks to generate the highest utility and value from materials and products over their entire lifecycle. For example, a 2014 Conference Board of Canada report identified that by moving to a more circular economy Ontario could support close to 13,000 new jobs in the province. This calculation, which is deemed conservative by the Ontario Waste Management Association, would also be accompanied by a boost to Ontario’s GDP of $1.5 billion. The Ontario government has committed to championing this transition through its ambitious Climate Change Strategy, Resource Recovery and Circular Economy Act, and draft Strategy for a Waste Free Ontario. CEIL’s first major activity is the Printed Paper and Packaging Rapid Lab, which is bringing together twenty-five public and private sector leaders to develop a shared vision for the future of printed paper and packaging materials in a circular economy. Many of Ontario’s leading manufacturers, municipalities, retailers and waste management businesses are participating in the Rapid Lab, such as IKEA Canada, Unilever, Canadian Tire, the City of Toronto, Progressive Waste, Celestica and Canada’s National Brewers. The complete list of participants can be found at circulareconomylab.com/the-printed-paper-and-packaging-rapid-lab. To stay informed on innovations coming out of CEIL’s Rapid Lab please subscribe to CEIL’s newsletter at circulareconomylab.com/newsletter. CEIL is powered by The Natural Step Canada with support from IKEA Canada, Unilever, the Ontario Waste Management Association, Canadian Tire, Canada’s National Brewers, Smart Prosperity Institute, Celestica, the Bank of Montreal Financial Group, Interface, WP Warehousing Inc., the J.W. McConnell Family Foundation and the Government of Ontario. More information about CEIL and its programs is available at circulareconomylab.com. Conference Board of Canada. Opportunities for Ontario’s Waste: Economic Impacts of Waste Diversion in North America, 2014. Available at http://www.conferenceboard.ca/e-library/abstract.aspx?did=6233. 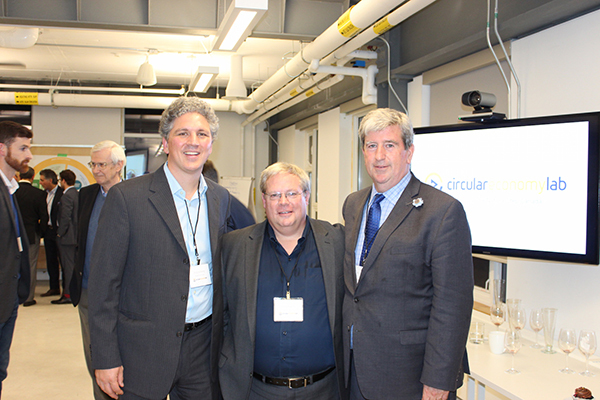 The article ‘Circular Economy Innovation Lab Launched at Evergreen Brick Works’ was written by Chris Lindberg, Director, the Ontario Circular Economy Innovation Lab.